I much admire Korean, Japanese and Chinese carved vessels, often with celadon glazes, as well as more recent work by ceramicists such as Tim Gee and the surface decoration of pots by Elizabeth Fritsch. The drip paintings of Jackson Pollock also intrigue me. 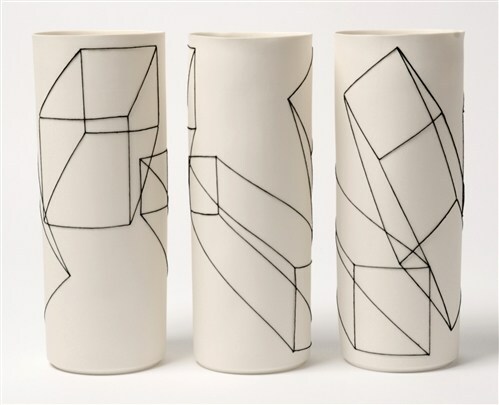 "Geometric Cylinders with Overlapping Images"
I much admire Korean, Japanese and Chinese carved vessels, often with celadon glazes, as well as more recent work by ceramicists such as Tim Gee and the surface decoration of pots by Elizabeth Fritsch. The drip paintings of Jackson Pollock also intrigue me. I particularly like the whiteness of porcelain for throwing and for slip cast vessels, as it shows off glazes to great effect. 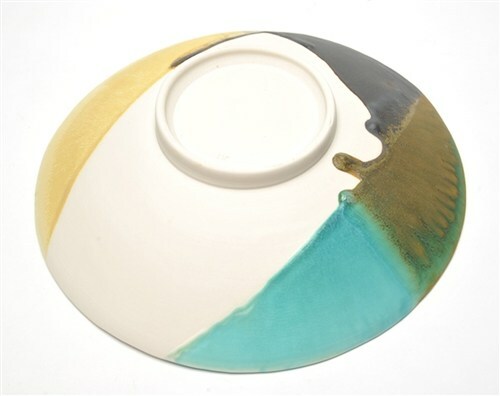 I have recently been using it to throw bowls over a hump mould and slip casting tall vessels. 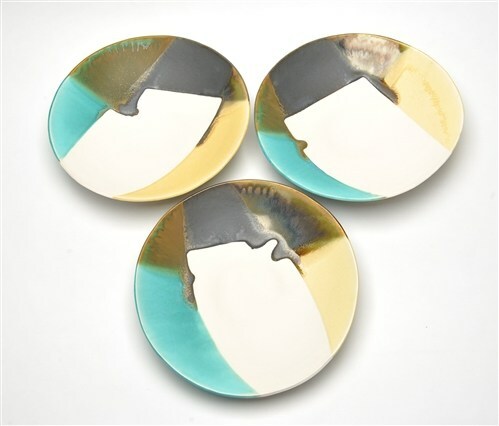 However I find some forms such as platters best thrown in stoneware because of its strength. I am still experimenting with different altering techniques such as piercing and eroding with water and sand blasting to give more interesting texture or surface design. Many of my designs involve abstract wavy lines which are reminiscent of mountains or waves on a beach. 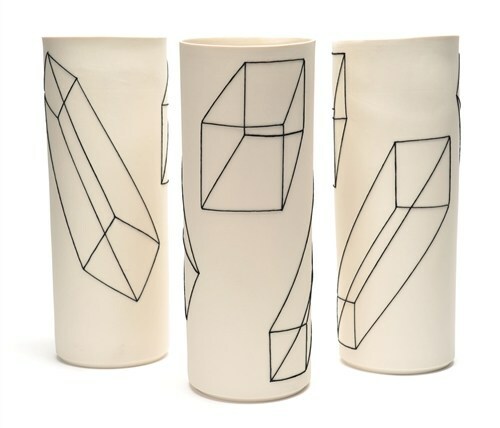 Recently I have started using geometric forms embroidered onto my slip cast cylinders, which causes a visual ambiguity as they wrap around the form. Similarly with my porcelain bowls, I enjoy the dialogue between the curved form and the lines of glaze left by dipping and the resulting overlaps. I get great satisfaction from the semi-permanent nature of ceramic vessels in our ever more throw away society and the ancient derivation of the art form.